"Towers of cool hydrogen laced with dust rise from the wall of the nebula. The scene is reminiscent of Hubble's classic "Pillars of Creation" photo from 1995, but is even more striking in appearance. The image captures the top of a three-light-year-tall pillar of gas and dust that is being eaten away by the brilliant light from nearby bright stars. 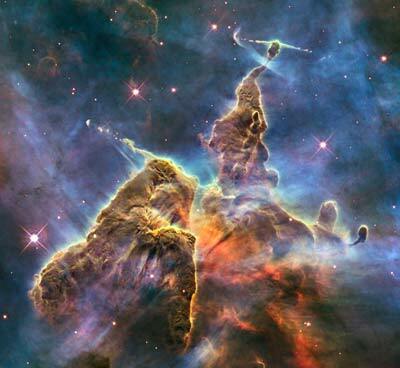 The pillar is also being pushed apart from within, as infant stars buried inside it fire off jets of gas that can be seen streaming from towering peaks like arrows sailing through the air." You can download NASA's featured photo in various sizes and resolutions here. You can also look through an amazing gallery of Hubble photos sponsored by NASA, plus a beautiful collection by National Geographic's here. Lastly, NPR has a nice audio slideshow that features astronomers talking about their favorite Hubble images. Thanks @lauraehall for the heads up on that.